Yeah, it's a fact. Sweden not only have a nuclear program during Cold War (frankly, who haven't? ), but also toyed with the possibility of pre-emptive nuclear attack on USSR (! ), in case they suspect that USSR is preparing for invasion. The RB-330 supersonic cruise missile was supposed to be a long-range first-strike weapon, for the single purpose of blasting the Baltic States ports thus disrupting the invasion efforts (and, also, several hudnred thousands of Latvians, Lithuanians and Estonians, by the way...) Eventually the project was scrapped, while Sweden military realised, that while they might just be able to hold off USSR by the nuclear deterrence, they definitely should not start the exchange themselves. 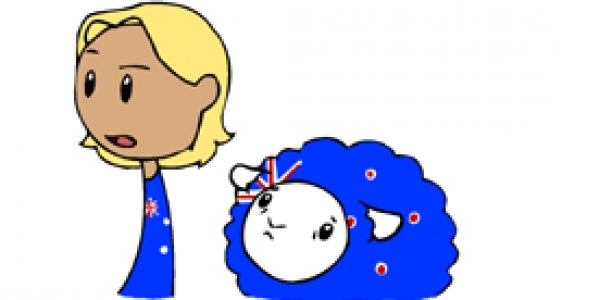 There are three sheep per person in Australia. New Zealand has seven times as many sheep as people. Both pale in comparison to the Falkland Islands' amazing 167 sheep per person! Are you Humon in disguise? Aww, I like it when Russia smiles here, it looks really genuine. See, he's not a bad guy, he just needs someone to like him. I doubt it's funny when people around you are afraid of you and think you're going to invade them even though you really don't want to. I guess that's a possible side effect of being big and powerful. How come Russia!s hat changes color and gets fluffier in the second panel, but turns another different color and goes back to the first panel’s design in the third panel? Denmark situation was worse. After DK decided not to have nuclear weapons (It started out on the forefront of nuclear research), the policy of the USSR was to nuke all Danish land until nothing over a foot was left standing so they could sail their baltic fleet out through the Danish straits. The US knew this and had deviced a counter: Nuking all Danish straits until it was impossible to sail through them. In case of WW3, Denmark would not only have ceased to exists as a country and a people, it would have ceased to exist as a geographical features. @moneblis It's a fake. Don't believe it! '@Baronese' Exactly. As' @Zuperkrunch' says, no is yes in Russia, especially with their fraudulent elections. @RedFascist i never said no is yes in russia, i wrote no is the new yes.. Nothing in russian language.. But we actually are very, very scared right now. espessially now when Nato tells us they won't help us. @EUcomicartist , well, what's the problem? You have all the technology, you have all the resources. Just make the bomb & became the nuclear power for themselves; for Sweden, the long-standing neutral nation, this would not cause any significant political problems. You have decent submarine navy & air force, you produce cruise missiles, so the delivery systems would not be a problem. Frankly, arm race is the much more efficient way to avoid the war, than any pacifist declaration; if your military capabilities are constantly changing, it is very hard for potential opponent to correctly estimate them. @EUcomicartist , what "evil side"? Nuclear bombs aren't "evil side"; they are just weapons. Weapons could not be "good" or "evil", peoples that use that weapon - could. But Sweden, of all potential nuclear powers (and there are quite a lot of them, actually - the nuclear weapon tech is so old, that many countries could build it with little efforts. They just did not try to do it either because they have no opponents worthy of such efforts, or because they worried that their opponents would do the same), is most neutral nation, with long traditions of mantaining such neutrality. Chances that Sweden would use its nukes for anything other than self-defense is literally zero. So if Sweden deploy her nukes, European public may went hysterical - let's be fair, European public tend to went hysterical, when military matters are concered, and the answer is not "let's do nothing and demand that USA should protect us"! - but it would be practically no matter in any real political consideration of the West. And for Sweden, it would be the easy way to boost defense capabilities without using an awful lot of conscripts. Nuclear bombs are much cheaper to mantain in peacetime; they do not demand payment & medical services, they just lay quietly in storages & required only periodical maintenance. @Dilandu The opposition to acquiring nuclear weapons would create a lot of unrest in Sweden & neighboring countries as well, Northern Europe (by which I mean Fenno-Scandinavia and Baltic countries) has remained free of nuclear weapons for a long time with Denmark and Norway having refused to allow nukes on their soil during peace time, Finland having advocated nuke-free Nordic since 1963 & Sweden having advocated expanding the nuke-free zone to cover all of Baltic sea, Russia of course has not removed their nukes from Kola peninsula (that I know of) though those should be mostly submarine-launched ICBMs, if Sweden were to acquire nukes Russia would bring shorter-range nuclear-tipped missiles into Karelia (not sure if they already have nukes stationed in Kaliningrad, but after Swedish nuclear proliferation they certainly would) which would put a lot of pressure on Finland to acquire a missile defense system, which would definitely anger Russia. 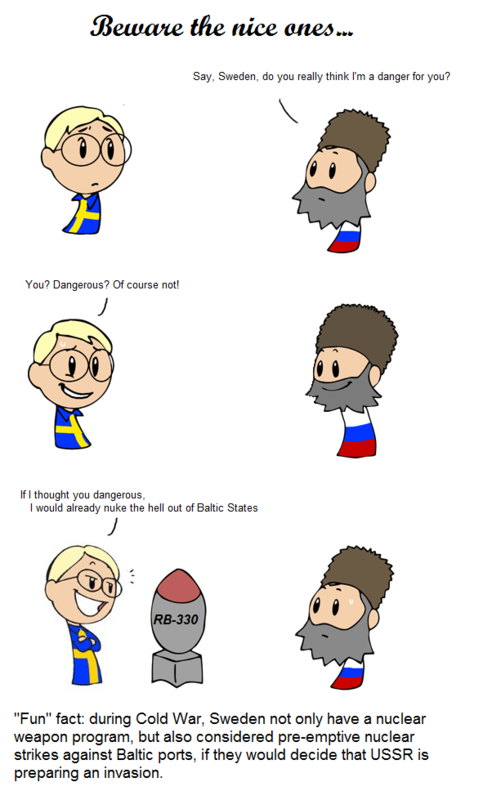 So no, Sweden should *not* acquire nukes.